An original letter of correspondence between brothers and business partners Joshua Coffin Chase and Sydney Octavius Chase. 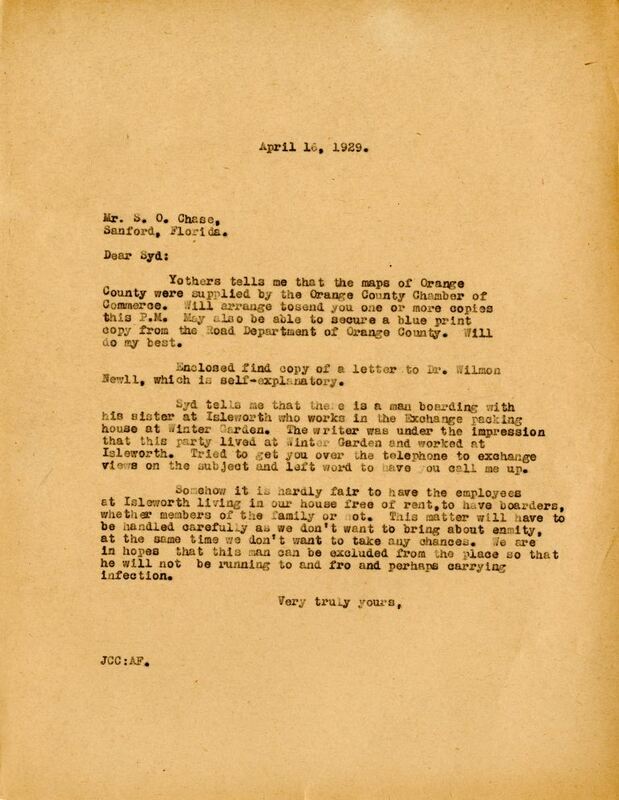 Topics discussed in the letter include obtaining maps of Orange County from the Orange County Chamber of Commerce, obtaining blueprints from the Road Department of Orange County, an enclosed letter to Dr. Wilom Newll, the residence of a Florida Citrus Exchange packing house employee at Isleworth Grove, and the free boarding of employees at the Chase house in Isleworth. Original letter from Joshua Chase to brother Sydney Chase, April 16, 1929: box 49, folder 20.84, Chase Collection (MS 14), Special and Area Studies Collections, George A. Smathers Libraries, University of Florida, Gainesville, Florida. 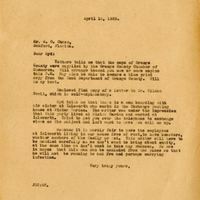 Digital reproduction of original letter from Joshua Chase to brother Sydney Chase, April 16, 1929. Yothers tells me that the maps of Orange County were supplied by the Orange County Chamber of commerce. Will arrange to send you one or more copies this P.M. May also be able to secure a blue print copy from the Road Department of Orange County. Will do my best. Enclosed find copy of a letter to Dr. Wilmon Newll [sic] which is self-explanatory. Syd tells me that there is a man boarding with his sister at Isleworth who works in the Exchange packing house at Winter Garden. The writer was under the impression that this party lived at Winter Garden and worked at Isleworth. Tried to get you over the telephone to exchange views on the subject and left word to have you call me up. Somehow it is hardly fair to have the employees at Isleworth living in our house free of rent, to have boarders whether members of the family or not. This matter will have to be handled carefully as we don’t want to bring about enmity, at the same time we don’t want to take any chances. We are in hopes that this man can be excluded from the place so that he will not be running to and fro and perhaps carrying infection. Chase, Joshua Coffin. 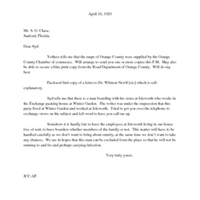 “Letter from Joshua Chase to brother Sydney Chase (April 16, 1929).” RICHES of Central Florida accessed April 19, 2019, https://richesmi.cah.ucf.edu/omeka/items/show/2704.